Centhron was foundet in winter 2001. It started out with an electronic intimacy between Elmar Schmidt (Voice + Synth + Programming) and Jörg Herrmann (Progamming) and the result was the demo cd “Melek Taus” in 2002 and concerts with “Suicide Commando”. After the success of the shows and the demo cd Centhron decided to record an complete album. The album “Lichtsucher” was released in 2003 an exceeded all expectations! DAC DJ Bullet No.1 in the DUC Charts, Zillo Sampler and massive requests and congratulations from all European Countries. And this all without a record label! Performances in Germany, Austria, Holland, Belgium and Italy have been rocked with Suicide Commando, SITD, Kiev, Xotox, Agonoize, Reaper, Psyclon Nine, Grendel, Soman and many many more. Each time from positive feedback to rapturous applause, everything seemed after the concerts. Next to frontman Elmar Schmidt and sound engineer Joerg Herrmann the live band is Melly Thies (Female Voice), Stefan Thies (Bass) and Anette Schmidt (Live Synth) and next from that moment they was the "Centhron family". Back with this success the second album “Gottwerk” was created and released in 2006. An electric firework from the finest. This time with the support from record label “Final Dusk” the album was received very well and drew large circles, not only in Europe, also in the United States. Unfortunatelly there was no distributor in the US for the albums, so Centhron decided to sent the cd’s on their own to the DJ’s and clubs in cause of the high requests. After three years with concerts a new album “Roter Stern” was released on Scanner (Dark Dimensions) in 2009. Mixed by Jan L. (x-m-p), Art-Work and Cover always by Claudi Corsten – A new “Gottwerk” burned the speakers from the chassis! After the tour with Agonoize and successful concerts the fan base could be increase tremendously. So, Centhron Mastermind Elmar Schmidt went full with energy into the studio to work and produce a new album. With all the impressions of the last years and in the new megalomania the result was the most danceable Centhron album released in 2011 – “Dominator” In Spring 2011, with the new live bassist Markus Vogler, the monster Centhron let loose in humanity. Starting with awesome shows supporting “Combichrist” the presentation of Cethron’s “Dominator was crowned by a successful tour across Europe and Russia, and a bombastic final concert in December 2011. 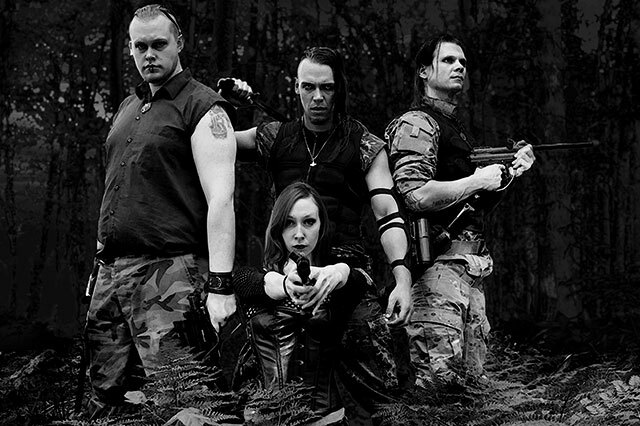 Early 2012 left Anette Schmidt the formation. At her place came on the synth’s Sven Hegewald who helped since 2005 for several shows and Louisa Hartwig, who took over the female parts in the band and became new family members. 2012 the constellation played some shows and Centhron went back in the studio. And in the spring of 2013, the new record "Asgard" will set a new milestone in the band's history. With an new and enhanced live show, the insatiable appetite for dancing masses, popping bass lines and haunting melodies will crush upon the world like Thor's hammer to crush the skull of the Midgard Serpent! See you all live on stage! All power to the bass drum!